We used plans for an 8x8 saltbox. Egg collecting can be accessed from outside as well as inside. Feeder and waterer are on slideable boards (my husband's idea) so that we don't have to actually go inside coop. 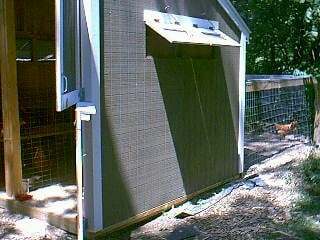 Coop can be accessed by wire door attached with hooks for easy cleaning. 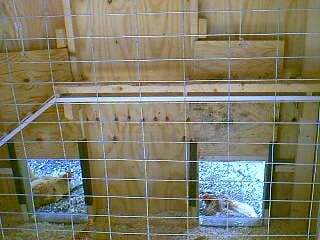 We let our roosters free range and then at night they jump up on roost right inside door for safety but cannot get to hens. 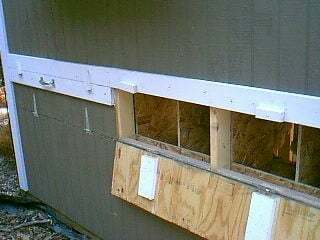 Electric box and light switch are mounted above the doors inside. We have 6 Buff Orphingtons and 6 Golden Comets with 2 Buff Roosters named Tony and Jeff after our favorite Nascar drivers! 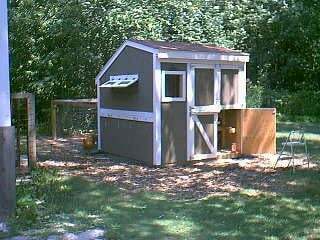 Plan to add small 4x8 deck onto the front of coop as well as a flower box under south widow for added decoration. 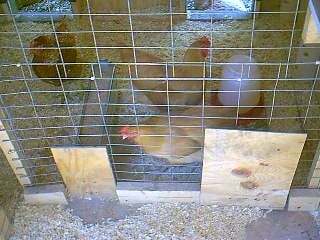 Hens are very happy and producing 8-10 eggs a day now! If anyone would have questions please feel free to Email us! 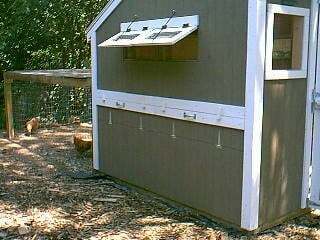 Would like to see more details about the coop and how you built it. And more photos. I guess I don't understand this sight, do we not get materials list?